Cytochemical electron microscopic technique to demonstrate the activity of cytochrome c oxidase (COX), one of the respiratory chain enzyme complexes in the mitochondria, helps to demonstrate the enzyme activity at inter- and intramitochondrial level in a given cell. The picture in the cover of this issue is a cardiac muscle cell from a mito-mouse carrying both wild-type and deleted mtDNAs, depicting (normal) COX activity in all mitochondria as indicated by darkly stained cristae. The mito-mouse was generated by direct introduction of exogenous abnormal mitochondria carrying mutated mtDNA into mouse zygote, and is thought to be the best animal model of the mitochondrial disorders. 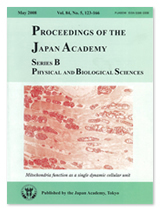 The study done by Prof. Hayashi and his co-workers sheds light on understanding the pathogenesis in mitochondrical disorders. All mitochondria in the COX-negative cells have no COX activity on electron microscopy showing “all-or-none” phenomenon. 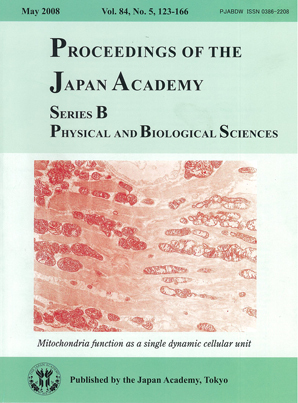 Prof. Hayashi's group clearly demonstrated the threshold effect to explain the phenomenon; when mutated mtDNA exceed over 75-80%, all mitochondria in a given cell become enzyme deficient. The uniform COX activity of mitochondria in a single cell in the mito-mouse indicate functional complementation between abnormal donor mitochondria carrying mutated mtDNA and normal host ones with wild-type mtDNA. The uniformity is the result of mitochondrial fusion and fission. This suggests that individual mitochondria within single cells exchange gene products with each other, enabling them to harmonize their function as a single dynamic cellular unit.